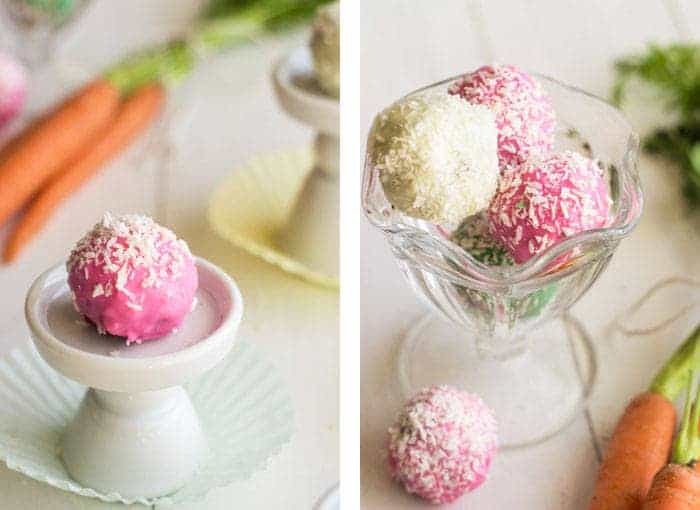 These Gluten Free Carrot Cake Truffles are soft on the inside with a crunchy, sweet candy coating….you’ll never know these cute little bites are only 100 calories! You know what I never thought that I would do? Greet Monday with a big, ol’ bear hug. And a noogie. Ya know, just because. But, seriously, the past 2 weekends have been crazy, busy family-a-go-go land for me guys. Last last weekend was my Grandma, and this past weekend the hubs’ g-parents came down to visit. Sidenote: do you guys refer to the weekend that was the one before the one that just finished, as last last weekend? Are you just confused now? Please tell me that I’m not alone. Anyway. Usually Monday’s are insanely crazy busy pants for me. But, because of the past 2 weeks, I can already tell that it’s going to seem peaceful and relaxing. And awesome. I know, who says that about Monday? Ca-ray-zay. You know what though, now that I’m thinking about it, maybe I don’t want Monday to come for tea. 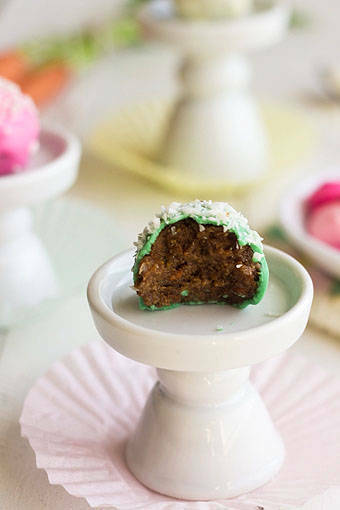 That would mean that I would have to share these gluten free carrot cake truffles. Y’all know how I feel about sharing. As in, I missed the day in kindergarten where they went over how sharing = caring. To me, sharing = less food for me. And that, my peeps, is just no. Like I mentioned, I have been making all the things in carrot cake form due to an excessive amount of test batches. We’ve had healthy carrot cake frozen cheesecake, gluten free carrot cake cupcakes and even gluten free carrot cake dip. I don’t even want to tell you how much carrot cake we have been eating. It’s practically a new food group in the FFF household. But, really, it has vegetables. I’m good to gooooo. Besides being all healthyish and delicious and yum, this recipe is fun to make….because it involves destruction. You get to take a perfect little carrot cake and get your hands all up in thur and mash ‘er up real’ good. Best. Ever. Also, apparently I lost control of the English language there. Sorry. Making the truffles is also a GREAT stress reliever. Like a stress ball…but edible. And candy coated. HOW CAN THAT BE BAD? On that note, let’s talk about the candy coating. At first, doing this almost made me need to buy a wig due to all the hair pull-age out-age. It seemed like such an easy concept: make a ball –> dip in chocolate –> voila! Truffle. And, really, it is…if you do it right. I was doing it very wrong, and the candy wasn’t coating the balls and they were just…balls of ugly. I mean, my Bible study still L-O-V-E-D them, but my eyeballs? They did not. Then, I found this AWESOME video on how to drip truffles from Dorothy at Crazy for Crust, and the truffle dip-age magically became easier! Dorothy is the queen of truffles (and pretty much all the desserts your taste buds could ever dream of!) and you NEED to watch that video…and check out her recipes! Drool fest fo’ realz. 2. Crunchy and sweet on the outside. 3. A surprise super soft and moist, carrot cake center. You may currently not be welcoming Monday with a bear hug and a noogie, but I can almost guarantee that face-planting into a bowl of these little bites will change that around. Oh, and did I mention that they are only 100 calories? 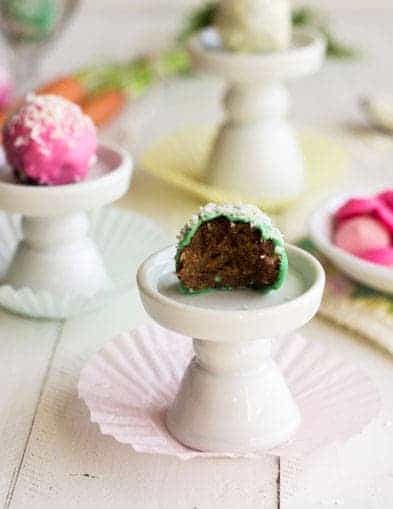 These Gluten Free Carrot Cake Truffles are soft on the inside with a crunchy, sweet candy coating....you'll never know these cute little bites are only 100 calories! Preheat your oven to 350 degrees and line the bottom of a 9 inch pie plate with parchment paper, spraying the sides with cooking spray or coconut oil. Set aside. In amedium mixing bowl, stir together the sifted coconut flour, baking soda, baking powder, cinnamon, nutmeg and salt until well combined. Set aside. In a large bowl, using anelectric hand mixer, beat together the eggs, coconut oil, vanilla extract and brown sugar until light and fluffy. Stir in the coconut flour mixture, mixing until smooth and lump-free. Stir in the grated carrots until all the carrots are mixed in and coated in the batter. Bake for 20-30 minutes or until the top is lightly golden and a toothpick inserted in the center comes out clean. In a large mixing bowl, beat together the softened cream cheese, brown sugar and honey until creamy and no lumps remain. Break the cooled cake into chunks and stir it into the mixture. I find it easier to get my hands in there and really mash up the cake, until it forms into a ball. Roll the cake into heaping 1 Tbsp balls, placing on the prepared cookie sheet. Let set in the refrigerator for at least 30 minutes so they are totally chilled. In a small bowl, Melt the melting wafers according the package directions. 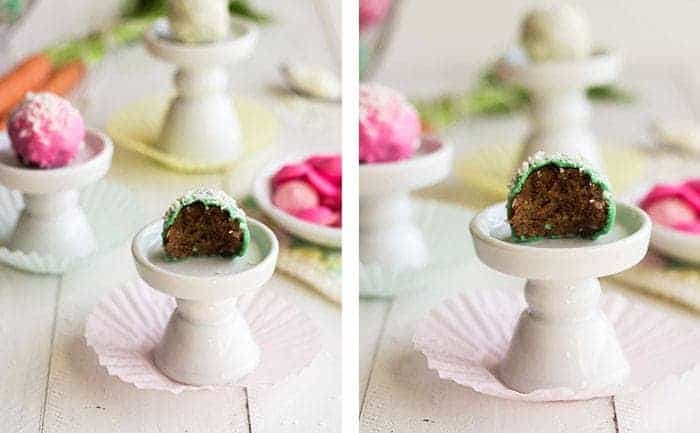 Drop each cake ball into the melted candy one at a time, spooning the melted wafer over top until it is completely covered. Lift the ball out of the melted wafer using a fork and gently tap your hand (not the fork!) to get all the excess melting wafer off. Repeat for all the balls. Devour immediately or store in the refrigerator until ready to use! 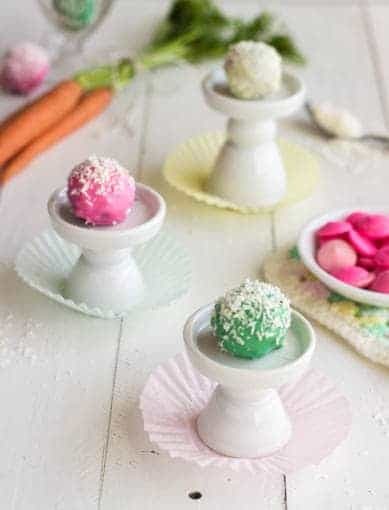 ** I learned a super easy way to dip cake balls from Dorothy at Crazy For Crust! Watch [this video! These look awesome! Love the photos too! 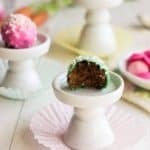 I adore carrot cake and your bon bons look terrific!!! This Monday is not my friend, as Springing Forward is basically from the devil. But a dozenish of these might perk me up nicely. That and twenty eight Red Bulls. I do agree on Spring Forward being from the devil! Twenty eight Red bulls and a dozen of these will definitely perk you up! I’ll definitely share with you! Thanks Melanie! WOW – Just WOW – These are adorable! And Sharing IS caring!!!! Specially when you post pictures of these adorable and downright delicious looking baubles! I know what you mean about Mondays being relaxing – my past few weekends have been extra cray cray as my dad had to be placed in a nursing home in February, so visiting him and my mom every Saturday and Sunday since has left me just bone tired – these days, Mondays -with work, soccer and everything else – seem so relaxing compared to the weekends! So cute! 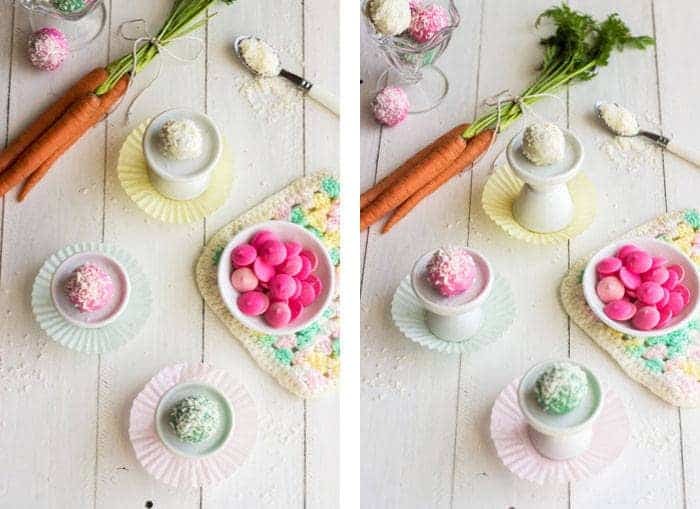 I love that you chose spring colors for the truffles….they remind me of an Easter basket! We love cake pops around here. It’s funny to see my 6’1″ fiance, a grown man, enjoying a pink cake pop. I know he’d go crazy for these too, especially since there’s no leftover sticks to keep track of how many he’s eaten. Haha that’s so funny about the leftover sticks! I love seeing my hubby eat “cute food” too! Thanks Annie! 1. these are gorgeous 2. I love coconut flour 3. You saved my life with that video! 1. Thanks much! 2. Me too. AMAZING. 3. RIGHT! Best video ever! These little nibbles look so pretty! 100 calories for a carrot cake truffle?? And gluten-free?!? Score. I love the colors–so cute! I was just going to text you about this weekend and now I know for sure that the grandparents were here… I’ll text you anyway. 😉 Have a great day, lovely! These are so cute! And I’m sure they taste amazing too!!! Thank you so much Aimee! 🙂 We loved them! Boy I bet those babies were hard to test taste. I ,mean…all that cake! Rough life we live! The hubs would loveeee these! Haha oh ya girl…it was just the WORST day ever. If it was opposite day! Thank you Dorothy! Your video literally saved my life so THANK YOU!! Thanks so much for the pin and sweet words Jenn! Okay, these just make me so happy with all their pretty pastels and carrot cake flavor! I’d welcome Monday in for tea if it meant I could have these! Okay seriously these are the cutest Easter truffles ever! Also I LOVE that they only have 100 calories, super win!! Gorgeous photos lady! Thanks Chelsea! You’re the sweetest! I currently have 2 dozen test cupcakes waiting to be devoured. The life of a food blogger. It’s hard work, I tell ya 🙂 These truffles look gorgeous. I’m loving the spring pastels. It definitely rough, but someone has to do it! love the colors in these gorgeous pics!! and not to mention this recipe sounds delicious =) but i do hate noogies… haven’t heard that word in forever LOL! Greeting Monday with a Carrot Cake truffle seems like an amazing way to start the week 😀 What a wonderful idea – carrot cake and a truffle into one? Pinned! Thank you for the sweet words and the pin Ceara! I think you guys will both love them! Let me know how they turn out! 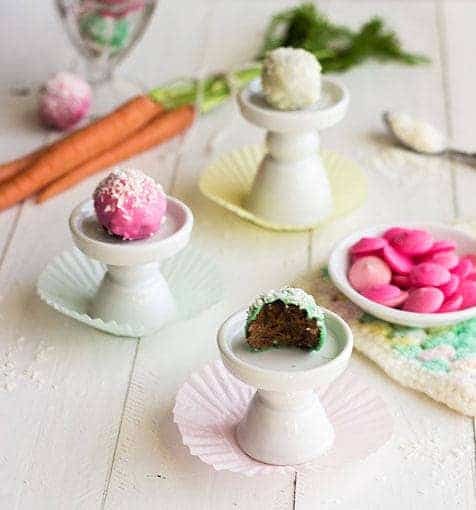 These look fantastic and so perfect for Easter entertaining! Thanks for sharing! So pretty. Skinny carrot cake? I’ll take it. No wonder you were stressed out on Friday about trying to get an entire weekend’s worth of blogging done!! That’s so busy, having guests two weekends in a row. Especially for an introvert. I’ve been away from my house for two weekends in a row, and I’m about to go insane — I just want a regular, peaceful, uber quiet, regular ol’ weekend! But hey, at least you had a few extra people to share goodies with, right? And I’m SO incredibly proud of you for reaching out to your neighbor too!! That first one is the hardest, but it gets easier. I promise. I actually rehearsed my speech a few times before knocking on a new door! “Hi, I’m Amy, I live just around the corner… I baked homemade ___ this afternoon; would you like some?” I’m a dork. Haha I am so glad that I am not the only one! I know right?! and I am going home next next week…so super short on my usual time! And yes, definitely for an introvert. SO HARD. Thanks for being proud! I thought of you when I saw the neighbor guy and was like IMMA DO IT! You’re not a dork. I <3 you. I plan to do minimal blogging, yep! You are so lucky to live so close girl! I miss that! I think I’d really like Mondays if they involved eating these truffles. They sound delicious and they’re the most adorable thing ever! :”) Also, your pictures are incredible my friend! I looove carrot cake…and carrot cake in truffle form? Yeah, that’s just brilliant. Haha, thanks Nicole! Glad you approve! These look delicious! I have a question though I do not need to be gluten free so can I use regular all purpose flour instead of coconut flour? Hi Pamella – unfortunately you can’t. Regular flour is A LOT different than coconut flour. I’m sorry!